Are you looking for something to decorate your yard, patio, lawn and garden and make them looks more pretty and charming? URPOWER Outdoor Solar Pathway Lights are considered to be the best choice for you in this year. With compact design, these weatherproof lights can create very comfortable feeling for great visibility. Come and buy URPOWER lights with no hesitation to light up your life right away! 1. The lamp should be charged for more than 5 hours under the sunlight before using. 2. If there is no good sunlight in 3 months, the battery may be out of power. At that time, you need to charge it under the bright sunlight. It will function properly again after being fully charged. 3. If the light blinks, it shows that the power is low, you need to charge it under the sunlight. Otherwise,the device will turn off soon. it may take longer time to fully charge the device. No screws, no wiring required. Certified to IP65, waterproof and durable. Charging during the daytime, auto turn on in the dark. Good Outdoor Illumination: This solar pathway lights is a great landscape light, which can create very comfortable light to your pathway, sidewalk, driveway. High Efficiency Solar Powered: It need to be charged for 5-8hrs in the first time, which make 6 hours working time possible. Solar panel absorbs sun light during the day to recharge the AA Ni-MH batteries more efficient than others. 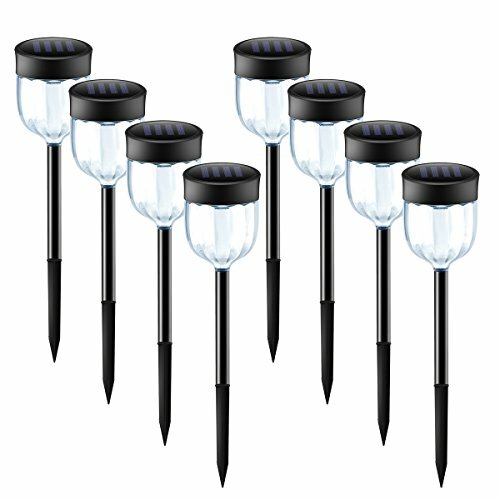 Easy To Install: No wiring required and directly insert the landscape light into soil for complete installation. Note: please open the lid and press the switch before installation. High Waterproof Rate IP65: It's made of corrosion resistant ABS plastic, which can ensure long 5lasting life and durability, don't worry about rain, snow, frost, or sleet.